The Magical Christmas Wreath Company: Hiiiiyah! It's the weekend! As I run out the door, I wanted to share my excitement. Its a very exciting day at Magical Manor. with someone very special to me. A date with the most charismatic and gorgeous creature ever. She was my first love when we grew up together. She is strong and confident. She is the ultimate prima donna. She currently has a penchant for Vivienne Westwood. Her fabulous head of golden hair has graced many a glossy cover. She is a lover of nature. I've heard we share a passion for all things green. She can model with grace and poise. She swims with exceptional elegance. She can play the trumpet with great gusto. Her acting prowess is legendary. She is a trained devotee in the art of karate. Oh yes and she can drive a truck! Wait for me Miss Piggy, I'm on my way! Hiiya, I thought she was already engaged to Mr. Kermit The Frog? Did they go uncoupling too? She's definitely a character - I know you're going to have so much fun!! Get those tap shoes on. Kermit was one of my first loves, let's split them up and take the pieces for ourselves. That's so funny. I hope you enjoyed your date with Miss Piggy. I hear it's a great movie. Happy Weekend to you. I'll take care of the 'green one' whilst you have your date with Miss Piggy - she is a tease with that off the shoulder look - but do be careful Mr. Paul. No, Rosemary, I got first dibs! Mr Paul, I am down your way at the end of next week - call me if you are around for coffee/cocktail/cocktail. I just saw the Muppet Movie last weekend! I laughed aaaaand laughed aaaand laughed! Damn you! Stay away from her - she's mine!!!!! You hear me? I mean it!!!!! 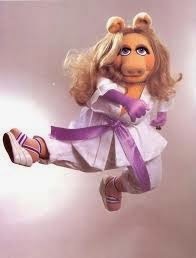 Paul, watch out she gets around and I heard she's still hung up on Kermie...I do envy her hair and it's flipping capabilities. 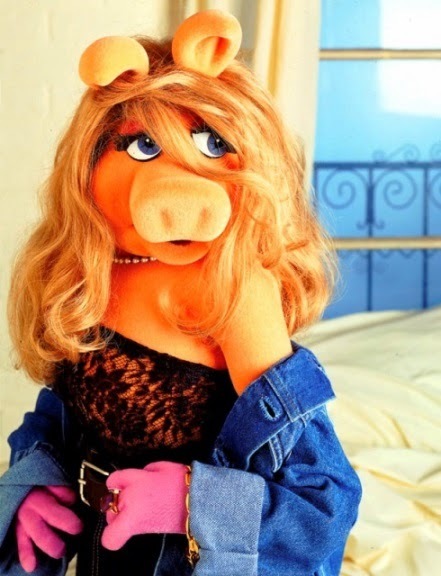 omg I ♥ Miss Piggy! What a fun post! Have a wonderful weekend!! here we share a love! I even own "Miss Piggy's Guide to Life" - hilarious. (Even more informative than "Dressed to Kill" by Diane Brill, a book I own of course too). The Magical Christmas Wreath Company create gorgeous handmade luxury Christmas Wreaths, Swags and Garlands. We can be found running, jumping and splashing around in flowers and gardens throughout the year. Follow our adventures. Like us on Facebook. What's behind door number #1? Meet Me at The Biltmore!